Your Nevada pest control specialists at Flatliners Pest Control can help you get rid of mice in and around your house and help ensure their nests are exterminated. If you spot one mouse in your home, this is a sign that more are probably lurking where you can’t see. If you start to see these rodents scurrying along your floor or hear noises in the wall at night, it’s essential that you call a mice exterminator to make sure the problem doesn’t persist. What Kind Of Mice Are You Living With? Because of the Nevada heat, mice’s most significant resource requirement is water and warmth on clear cold winter nights. One way to avoid attracting mice into your home is to curtail feeding your pets outside so as not to draw the mouse with any leftover food and water sources. 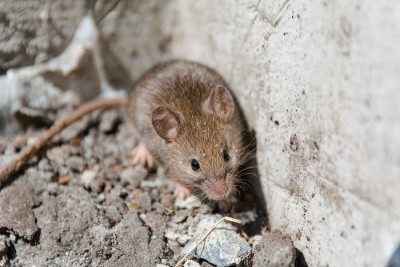 Mice are excellent finders of holes under a home’s foundation and can wreak havoc on your property. They can also leave behind foul odors from rotting food, urine, and feces, that can become hazardous to the health of both the people and pets of the residence. Mice will cause damage to drywall and insulation as they drill themselves into your home to attempt to make their nest. Mice have even caused house fires after chewing through homes wiring systems. In our desert environment, the risk of fire damage is too high to ignore. A mouse infestation needs swift action to protect your home’s structural damage, decrease the possibility of disease associated with mice such as Hantavirus, and prevent electrical fires caused by ice. If you’ve heard scampering and chewing sounds in your walls, let Flatliners Pest Control help you bring down the mouse population in your Las Vegas home to zero. Call us today to schedule an appointment.